The two North West farm workers have been found guilty of killing 16-year-old Matlhomola Mosweu and will be sentenced tomorrow. Pieter Doorewaard and Phillip Schutte have been found guilty of killing 16-year-old Matlhomola Mosweu in the case that has been dubbed the Coligny sunflower murder. The two North West farm workers heard their fate at the North West High Court in Mahikeng where they were also facing charges of intimidation, theft, pointing a firearm and kidnapping. 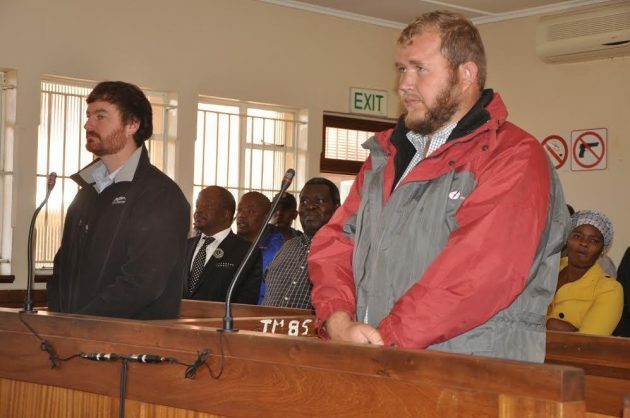 Doorewaard, 27, and Schutte, 34, reportedly assaulted Mosweu and threw him out of a moving van on April 20 last year at Rietvlei farm near Coligny, after accusing him of stealing sunflower heads from their employer Pieter Karsten’s sunflower plantation. They initially claimed that Mosweu jumped from the van and was not pushed. Mosweu’s death set off a mass violent protest in Coligny that left six houses and three trucks torched and several shops looted and damaged. Although the pair were out on R5,000 bail, they will remain in custody until they appear again tomorrow for sentencing.